The project "Fuel Cell Bus for Berlin" aims to demonstrate the first European imple-mentation of a fuel cell bus using liquefied hydrogen in an inner city situation. The use of a zero emission technology will demonstrate the environmental benefits to be realised through the expected market introduction of this type of technology in heavily polluted cities. Urban traffic managers are constantly seeking new ways to improve the local air quality of our towns and cities through changes in passenger trends. Vehicle pollution is a major contributor to environmental impairment. By demonstrating the use of a nonfossil, zero emission fuel it is expected that the market response will encourage manufacturers and urban planners to view fuel cell technology as the way forward. The use of this technology will show how European dependence on foreign energy sources can be decreased and also shows the longer term benefits of lower emissions and less noise pollution. As this technology is very much at the cutting edge of vehicle design and development and important for the further development of related fuelling technologies and conformity regarding safety standards it is hoped that the project will provide guidance for manufacturers and researchers on further need for action regarding fine-tuning. 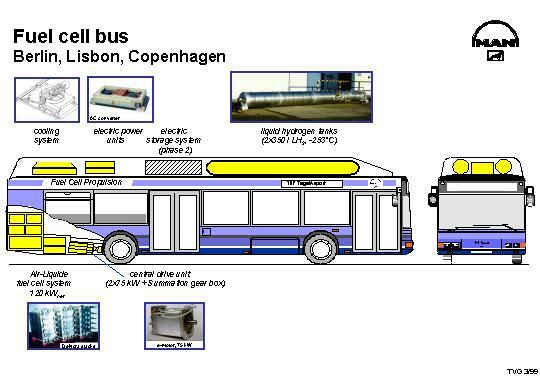 Figure 1-1 shows the technical data and capacity of the fuel cell bus design. The bus, manufactured by MAN, is a low floor vehicle type NL223 and will be powered by a fuel cell battery in place of a diesel engine. Additional peak load is covered by a high energy battery storage. The LH2 storage system consisting of vacuum super-insulated bottles, containing 700 l LH2 and the shut-off and safety equipment is situated on the roof of the bus. The hydrogen will be stored at a temperature of - 253°C and has a lower weight and system volume than gaseous hydrogen. The bus will be tested initially for a period of 18 months in the city of Berlin on the route between the airport and the city centre by the BVG. It will also undergo test runs in Copenhagen for four months operated by HT and in Lisbon for four months operated by CARRIS. An operation plan will be set up and implemented. The bus will be equipped with registers and the operator will take care of the measurements. The bus will be integrated within the respective bus fleets during the demonstration period in order to allow gathering of economic data under everyday conditions.